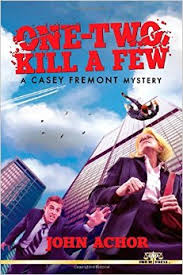 Author John Achor, of Hot Springs Village, Arkansas introduces amateur sleuth Casey Fremont in a newly released edition of “One-Two, Kill A Few: A Casey Fremont Mystery,” the first in the Casey Fremont series from Pro Se Productions. Casey Fremont is on her way to interview for a temp job when a falling body nearly lands on her. Three days later, a second man, this one from her own office, dies in a similar manner and Casey is drawn into the intrigue. She confirms her suspicions, but one of her friends ends up in the hands of kidnappers. Casey must solve the mystery before she becomes the third body to go over the railing. “One-Two, Kill A Few” is available in print edition from Amazon and Barnes & Noble. The eBook version is also available for the Kindle (Amazon) as well as Barnes & Nobel (Nook).